� Just got back from a trip to New England to see my girlfriend Tamars family.� Of course I had to pack up the splitty for a tour on Mt Washington, the right of passage for back country skiers and boarders in the New England area. We left Bethel ME at 6 am and headed for the ravine. Only about a 50 minute drive we were hiking up the beautiful trail by about 7:15. It was a beautiful day by all means with not a cloud in the sky and temps in the 70's. Amazing the amount of people hiking that trail. Oh but what a place, so beautiful. � � �I was the only person on the Mt. with a splitboard. A lot of people had never heard of one and some people were taking pictures of it. � � We stopped at the rest area on the trail about 3/4 the way to the bottom of the ravine and talked to the medics at the bathroom area about routes and two of the medics turned out to be Tamars parents good friends when she was a child. She used to babysit their kids when they would run marathons. 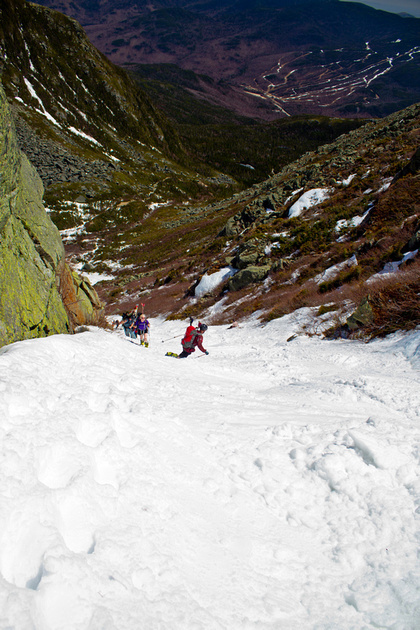 One of them ,(Paul) is 74 years old and hikes Tuckermans 5 days a week(amazing the shape this sport will keep you in ). � � � After getting stability info. from Paul and Lisa we decided to ride the Left Gulley because of falling ice in a lot of other areas. It was a great hike up and the spring corn was looking like a lot of fun. Towards the top of the gulley I went right and climbed up onto the ridge, took a few photos and started switching over. Pulled the skin off of one half and then the other half. There were a bunch of shrubs where I was at and I was using them to set� my board on, but when I set the second half of my split down to begin latching them together I was a little careless, because before I knew what happened�the board bounced and flew over the small cliff I was above. Luckily it went air born over the cliff and stuck in the snow right at the beginning of the small rock face I was above. Scared the crap right out of me for a couple of obvious reasons, #1 People possibly hiking below me. 2 The slope that it stuck in on was about 70 degrees and that transitioned to about 45 degrees in around 100 to 150 yards and below that cliffs that were large. Before I left the car I took my crampons out of my bag as I didn't feel I would have a need for them or my ice ax, but I found myself in a situation where both would have been put to good use. Instead I had to slowly kick in some serious boot holds as the snow really wanted to slide because it was so warm out. I took my time and after a quite white knuckle experience I was able to recover my board and climb back up to the ridge.. Thank god the board stopped and nobody was injured(lessen learned: SLOW DOWN AND BE DELIBERATE at all times when on exposed terrain). Due diligence is sometimes overlooked in the most common of tasks. � � �The ski down was tons of fun with great soft spring corn. Its back country but the moguls were as big as any I've seen at Baker, but I had a blast transitioning through them. There were a few rocks to watch for but coverage was on average great. In a few minutes we were at the bottom switching back to hike mode and on our way down the trail. This was my first time ever to the east coast and the landscape with all the different trees and gorgeous waterfalls was a site to behold and I took as much of it in as I could. � � �The hike back to the car felt longer than the way up as usual. It would be great to hit this ravine when you can ski all the way to the car. Tamar ran into one of her best friends from high school that she had lost touch with. Small world. Thanks Vince. All of us expats whelped on the White Mtns always appreciate reminiscing about the place that started our addiction. Glad you got to touch it and bring us back your amazing photography. Lots of good memories up there! My friends and I brought so much meat up to the lean-tos one year that even a year later were known as "those guys with the bacon." Tucks and Huntington's are where I learned to ski steep snow. I can't think of a better place. Watching drunk people ride inner tubes over the headwall was always a good time too. � �(lessen learned: SLOW DOWN AND BE DELIBERATE at all times when on exposed terrain). Due diligence is sometimes overlooked in the most common of tasks. In my SCUBA classes, I was taught to do everything "Slow and relaxed with good technique". I don't always follow that advice but I have had a few situations like yours before where I wish I had. Friday on Rainier with SaxyBrian was a prime example, we were headed back to Paradise and ended up 200 ft below Paradise almost in the Nisqually Valley. Looks like an awesome tour though. Glad everything worked out for ya! � � � � I was very excited about this trip to Tuckermans not only because I was going farther away from home to snowboard in the back country than ever before, but of the photos and a story for a report on TAY because I know how many New Englanders there are on TAY.� I'm just happy that for some my photos took you down memory road. Thanks for the compliments on my photography, it is my passion that I take a lot of pride in. Another NE transplant here. These pics also tug at the heartstrings. Had lots of great times up there. I hope you had a Tuckerman Ale and stopped at the Moat aaah, the Moat. Our snow melts very quickly out here -- a May 5 TR isn't even worthwhile beta for right now. As for a couple weeks from now, any skiing will be skiing for the sake of skiing (if you know what I mean...). Figure ~50' vertical (yes, fifty) easily accessed from near the top of Otto D. Rhoade, or ~500' (or perhaps as little as half that) by hiking up (and down!) 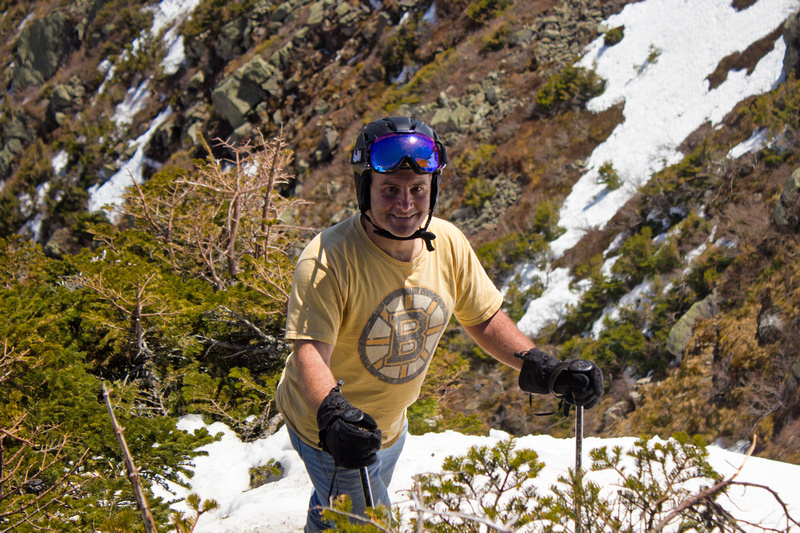 ~2,500' vertical from the Pinkham Notch trailhead. thanks for heads up and b-day wishes for mom! celebration is at maplewoods golf course...should be a hoot. think i'll leave the gear behind this time. i'm not a TAY�r by definition (i.e. skiing 50' for skiing sake) and I'll have my 7 year old little lady in tow so i'll keep it simple. better to just take her out to the lake of my youth. stoked to be back up at the notch. Yes, the Flume and all of Franconia Notch is still just as dramatic and enjoyable a tourist/sightseeing/hiking spot as ever -- your daughter will love it! Wow Vince, what a great line to cross off the list, such an iconic decent. Good for you! Thanks for the report!